We send Jon Falcone to uncover the crafty German beers invading London. Whilst the bold and the beautiful may be all about the American IPAs and craft ales, and CAMRA members like their ales dark and twiggy, the German pilsner has, of late, become a rather unfashionable offering. It’s in part sullied by the ongoing popularity of faux German beer halls for the post-work booze-binge crowd. Also, the perception of Becks continues to move (unfairly) into the Fosters/Carlsberg ‘pissy’ category. With all this going on it’s easy to forget that the brewing process for the golden lagers many of us enjoy today was born in Germany. This is something Alistair Hook, Meantime Brewery’s founder and brewmaster, has never forgotten. Alistair spent years in Bavaria developing his skills and exploring the world of Pilsners, Weisse beers (white beers), Hefeweizens (wheat beers) and all things German and golden. 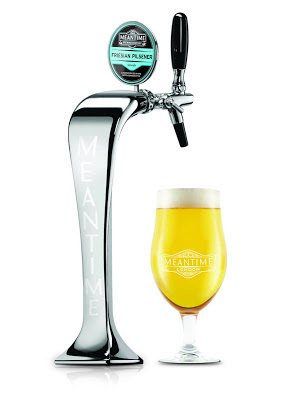 With a love of this lager style, the ever pioneering Meantime Brewery have just released a seasonal Friesian Pilsener. Available for the next two months, the Friesian Pilsener uses pilsener malt and Perle hops in a Northern German style brew. The result is a crisp, refreshing pilsener with a lovely, slightly bitter, aftertaste. It‘s easy to drink and with the bitterness (which comes from the North German brewing style) it works wonderfully when paired with bold food flavours like red meat, cheese, and fish. London Fields – 3 Weiss Monkeys (5.5%): This London Fields seasonal literally mashes up the IPA style with a German Hefeweizen. It mixes the citrus of a wheat beer with the depth in texture of an IPA. Camden Brewery – Camden Wheat (5%): In neighbouring Camden, they too have a Hefeweizen. This one’s slightly weaker and focuses on softer, sugary flavours such as banana and vanilla. The Lamb Brewery – Hefeweizen (5.2%): A Chiswick based offering, the Lamb Brewers’ Hefeweizen is cloudy with a honey flavour and a hint of cloves. Zero Degrees – Wheat Ale (4.2%): This restaurant and micro-brewery small chain has a Blackheath premises, and offers a German styled hefe-weizen that goes for the classic vanilla and banana pairing. The Meantime Brewery Friesian Pilsner is available at the Old Brewery and other selected outlets for a limited period. Welcome to the Fluid London blog, a sideways look at London’s eating, drinking and socialising culture. Everything from bars, restaurants, pubs to clubs, with all the lovely little gaps in between.